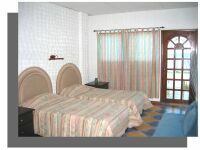 These suites are really good value for money as they are a good size and have some nice furnishings. They are located on the ground floor of the main building and all have easy access to the beach and pool areas. The bed configuration varies ranging from 2 twin single beds up to Queen sized double beds. In these suites we have the large and comfortable steel sofa beds for those extra people. With cool air-conditioning and hot and cold water what else could you ask for.